Knowing how to manage your money and credit is more important now than ever before. Your personal credit history affects your ability to get a loan, car and home insurance, and even a job. Your credit history is like a credit resume, detailing what loans and lines of credit you've taken out, how much credit you're using, and how well you've repaid your debts. By taking Credit When Credit is Due, you'll get the information you need to get and keep your finances and credit on track. A program that adds a positive statement to your credit report. When you complete Credit When Credit is Due, you'll receive a packet with cards you can send to the three national credit bureaus. When you send in the card, a statement will be put on your credit report that says: "I have successfully completed Credit When Credit is Due - Credito Al Merito, a 12-lesson national standardized education program on credit and financial education. Proof of completion can be verified. My book registration number is xxxxxxx." This statement will be a positive addition to your credit report, although it will not increase your credit score. Know the basics. You'll learn basics about the four-step process of any financial deal. Get the facts about credit. You'll learn about choosing and using credit cards that are right for you. Understand the loan process. You'll know what to expect when you apply for a loan, and you'll learn how to decide when to borrow money. Make car-buying easier. You'll learn the basics of buying a car, so that you know how to get a good deal and buy a car that fits your needs and budget. Fix your financial problems. You'll learn what to do if you fall behind on your bills, and how to rebuild your credit if you've had difficulties in the past. Q.) I seem to make the same mistakes with my money over and over again. Will Credit When Credit is Due help me stop the cycle? A.) If you apply the information you learn in Credit When Credit is Due, you can make wiser choices with your money. When you finish the course, you'll have a better understanding of credit scores, the importance of paying bills on time, budgeting skills, appropriate amounts of debt, the importance of saving money, and the importance of carefully reading and evaluating credit card and other offers to find out whether they are right for you. You'll know what to do – and why – to keep your finances in good shape. Q.) I know I need to teach my teenagers about money and credit, and I want to be sure I give them good information. Could this course help me? A.) This course is an excellent one for you and your teens to take together. The lessons are easy to understand, so they're good for young adults who are just learning about budgeting and credit. In fact, many people who take Credit When Credit is Due say this class should be taught in high school and college. 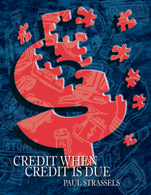 Credit When Credit is Due covers the basics of personal finance that your kids need to know. Q.) My spouse and I fight about money. One of us wants to spend money on a new TV, eating out, sporting events, movies, etc., but the other wants to save money and stop living paycheck to paycheck. Could Credit When Credit is Due help us do better with our money? A.) Credit When Credit is Due includes lots of real-life stories about decisions people have made with their money. The course can help you and your spouse understand how important it is to spend carefully, use a budget and save money. Many people who finish Credit When Credit is Due say the course helped them talk more easily about financial situations, so you may find that you and your spouse can communicate better about money after taking this course.